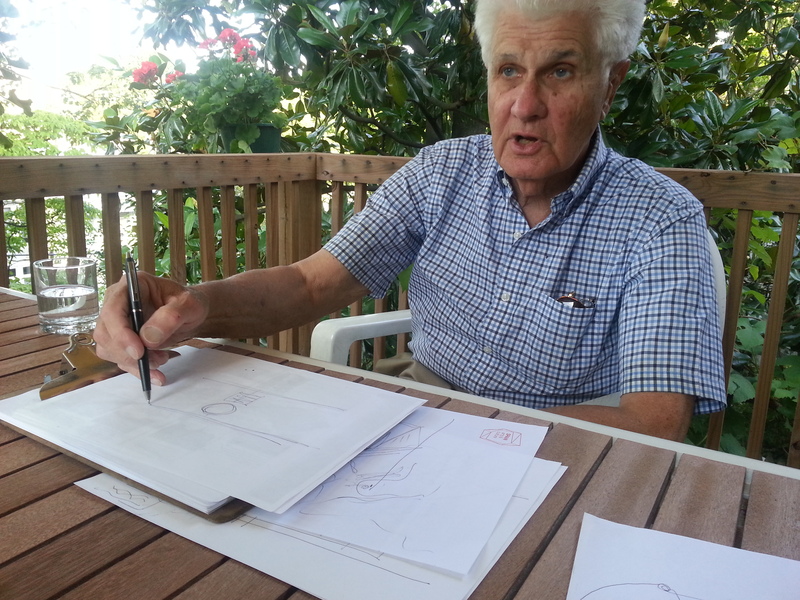 Earlier this year, we met with DC architect Paul Spreiregen to talk about an idea that’s just as good today as when he first proposed it 50 years ago. Back then in the mid-60’s, DC civic leaders were looking for ways to bring people back downtown all throughout the year. 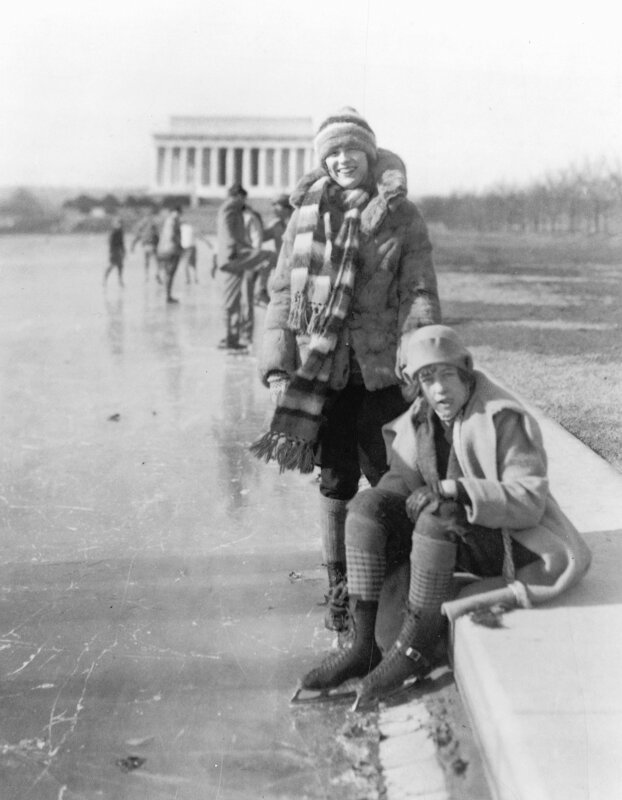 Spreiregen, who grew up in the cold winters of New England, had an idea: freezing the Reflecting Pool and turning it into hockey rinks and skating ponds. “Here is a well researched article in PuckBuddys on our federal government and fun and big idea to freeze the reflecting pond in winter to allow for ice skating on the Mall. I had heard about this effort before but had never seen the details such as presented here. A great read. check this out For More Info. It is very difficult to get things done in DC as this article details.”Delay is death”. And it is also very expensive, as there are many layers of government to negotiate with and get approvals from and budget as it relates to any new development in downtown DC. Coordinating Federal departments, and local auspices is a challenge. Would this be a national effort, a local effort? Local tax dollars? Federal tax dollars? Who pays for maintenance? Insurance? Upkeep? And on and on. 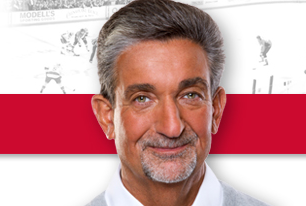 As a small for instance on the unique character of DC, I have been trying to find a way to improve traffic flow out of Verizon Center for more than three years – and simply would like to see how we could coordinate lights and traffic patterns for more efficient egress for our fans. Some of our wisest and most powerful political leaders locally have signed up to help. One simple request was asked as a test, could we time synch the lights on one avenue to allow for a quicker and less interrupted trek from our city to the suburbs? Could local police play a role in helping to get our fans out of the building and on their way home in a selected hour period of time – say from 930 pm to 1030 pm, sometimes a bit later for concerts. Many buildings around the NHL and NBA offer such services, and I thought it would be smart and safe to do likewise for our fans. Sounds simple, right? I envisioned one master control panel where an individual could reprogram the lights, and one set of meetings with all the folks that touched this decision and this would be an easy request, as after all, our community has the most technically advanced infrastructure in the world! But it is more difficult than you think, as the Park Department, Homeland Security, Department of Transportation, Department of Interior, Secret Service, local DC Metropolitan Police, the City Council, and some differing tech infrastructure, with old software code seems to get in the way. In fact, in some cases, literally, no one can figure out who is actually in charge and can deliver on said request and test. Whenever you touch the National Mall, or Constitution Avenue – in any way, add lots of complexity on just finding the answer to, “who is in charge?”. We keep at it – we continue to meet. Perhaps one day we will deliver. It wont be for a lack of trying. Everyone is helpful, everyone agrees that we can do better. I remain hopeful. Also – at Georgetown University, there has been work underway regarding its boat house and a permit and land swap, I am being serious here, the work is active and enters its fourth decade of meetings, more than 40 years of work, without a final decision! I have attended several of the meetings to try to help, “Delay is death”. Paul Spreiregen’s ice skates aren’t as sharp as they were 50 years ago. But it’s a good thing he is. 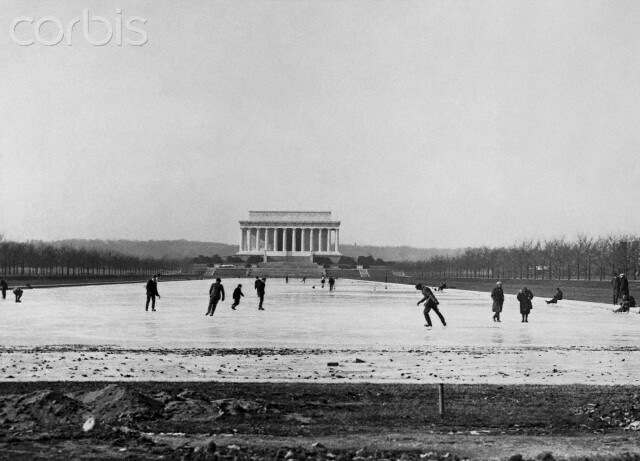 Had he got his way fifty years ago, the NHL’s 2015 Winter Classic could have been staged on the National Mall Reflecting Pool. Millions of hockey fans the world over would have watched the Capitals and the Blackhawks battle it out in the middle of one of America’s most iconic landscapes; a game played literally at Lincoln’s feet. But perhaps, his idea still has some life left in it. But 50 years ago this summer, Spreiregen and his colleague Louis Justement had a genius idea. 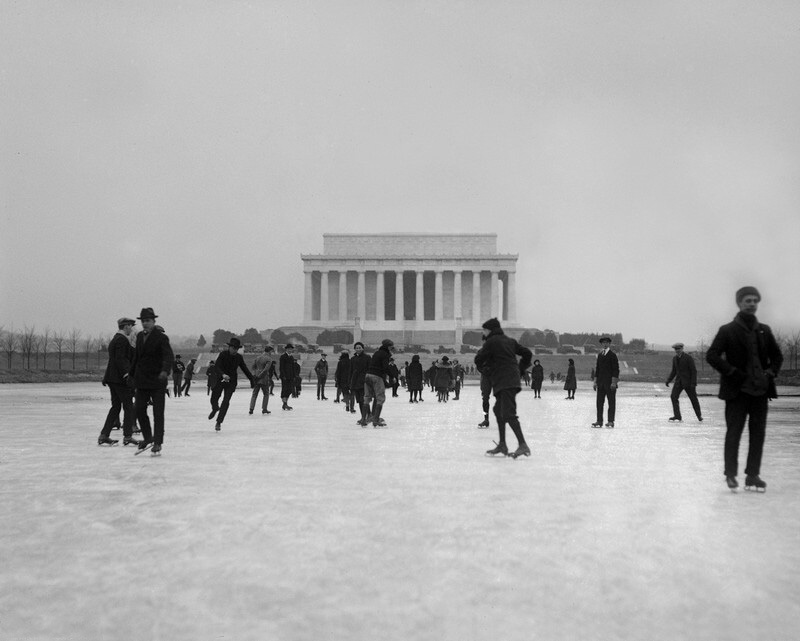 Noticing that visitors to DC dropped off precipitously during Winter, Spreiregen offered a proposal as radical as it was simple: freeze the Reflecting Pool on the Mall for season-round ice skating and hockey. The idea caught fire. Secretary of the Interior Steward Udall loved it, as did Senator Frank Church, a close political ally of President Johnson. The Administration held a sweltering July press conference at the base of the Lincoln Monument, the long pool extending into the background, with Spreiregen holding up a pair of authentic Dutch long distance ice skates…the kind you might imagine Hans Brinker sporting. Just think, they said, what this could look like in just six months. For the then relatively low price of $3 to 4 million dollars (about $25-35 million today). refrigerator coils would freeze the entire Reflecting Pool for the duration of the winter season. That’s an 8 1/2 acre ice rink – enough area for ice skating, curling, and upward of 7 hockey rinks – all in the heart of the National Mall. Everyone was on board it seemed, until the bureaucrats got involved. In the time-honed Washington tactic of ‘delay until dead’, Spreiregen’s proposal foundered and eventually melted away. But Spreiregen is still very much around, and so is his idea. And this time around, with Washington preparing to become the largest stage in the NHL calendar hosting the 2015 Winter Classic, it just might be an idea whose time has come…again. Spreiregen is sharing lessons he’s learned over his 50+ year career, seated in the shade of his outdoor porch high above his Glover Park home. He’s funny and engaging, and the conversation sweeps between urban design, music, the transformative uses of buildings, Boston’s Fenway, and the biology of wolves. 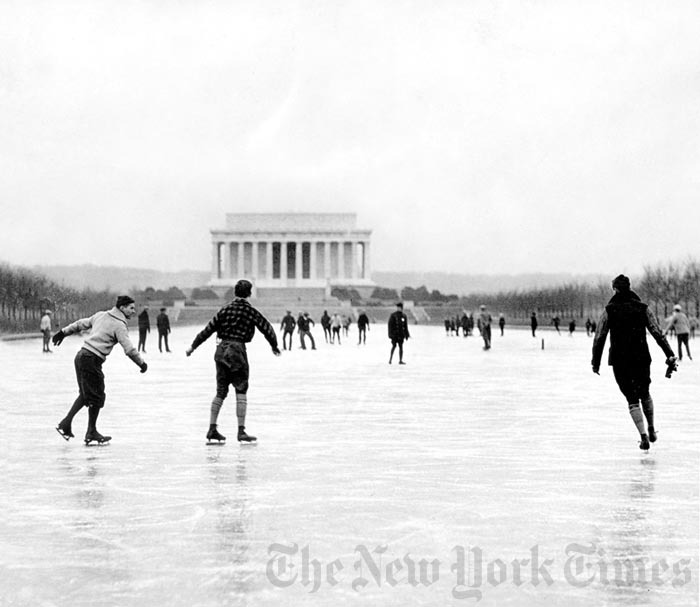 “Why didn’t it happen?” he asks of the Reflecting Pool rink that never was. “That’s just one of those classic Washington stories,” he says, and laughs. In the early 1960’s, as Washington filled with the boundless New Frontier energy of the Kennedy administration, Spreiregen began to design buildings, champion the re-imagining of urban spaces, and meet like-minded DC movers and shakers. One of them was Louis Justement, “an excellent architect” and designer of, among other things, Sibley Hospital. The Washington winter of 1960, his first one since moving from his Boston home, was particularly cold. “Everything froze, including the Reflecting Pool, and people went skating on it. Duh,” he chuckles. 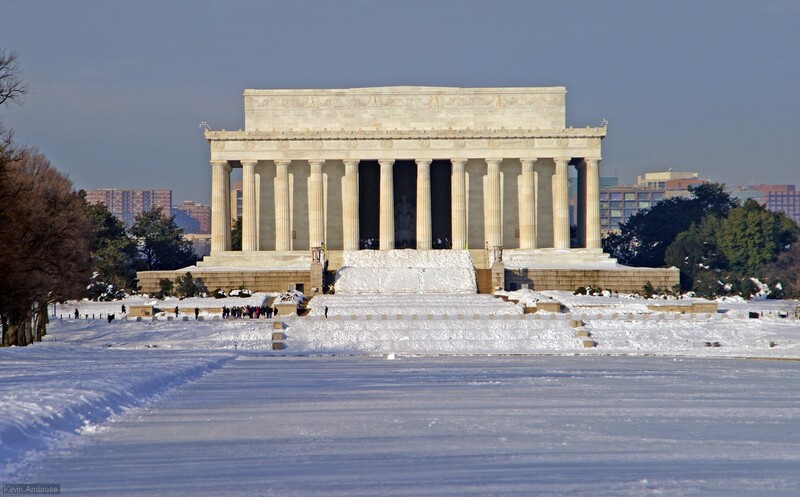 Quickly the idea to turn the Reflecting Pool into a national wintertime attraction rocketed up Washington local and federal bureaucracies. 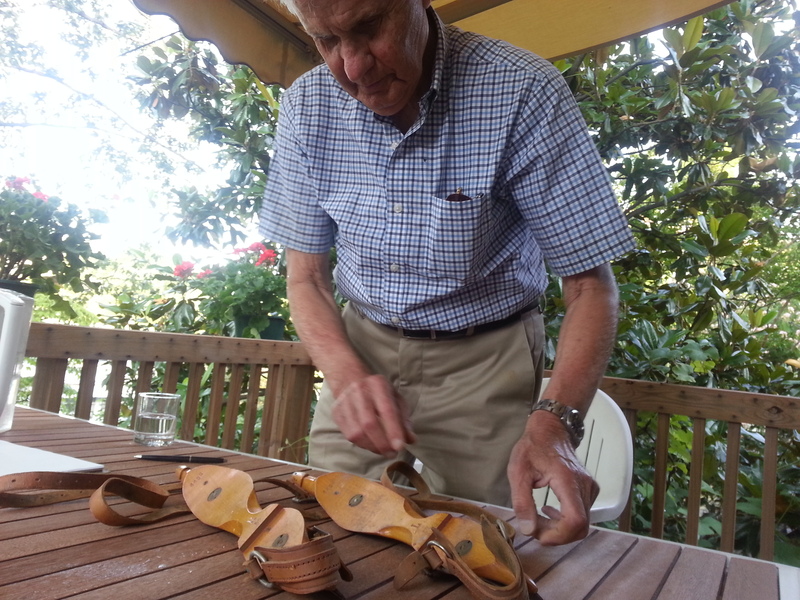 Secretary Udall staged a major news conference in July – the one Spreiregen attended with his wooden Dutch skates. Many in the government agreed, except for an obscure collection of bureaucrats who saw themselves as holding the keys to the Mall. “I said, you want people doing things outside, just having fun, but they sort of sniffed and said ‘We really don’t like that kind of thing.’ They wanted pristine lawns, absent of people. How times have changed,” he said. When he heard that the study would take a year, Spreiregen knew that the fate of his proposal was sealed. “Here’s the lesson: delay equals death. They didn’t like it, and they killed it with delay.” Sure enough, by 1965 few remembered his idea. The bureaucracy had moved on, leaving his hopes behind. In this town, there’s nothing so old as yesterday’s hot story. Both Washington and Spreiregen moved on. He joined the Downtown Progress Association and helped the city’s center again become vital and filled with people. And now, with the Winter Classic just six months away, that moment may be at hand. It’s increasingly clear that the main event – the beat-down the Capitals will deliver to the Hawks – will be held either at Nationals Park, or in a pinch, the rather less glamorous but definitely more old school RFK Stadium. Or God forbid, Baltimore. The NHL will be announcing the venue soon. The stadiums make sense. An event that big, you need a stage big enough to accommodate the throngs of fans, press, curious and hockey-obsessed that will pour into town. But Winter Classic week, and hockey more broadly, is about much more than one game…one very, very important game. (The first Classic attended by a sitting President? It’s a possibility – if the Obama family forgoes their usual Hawaiian Christmas vacation with their PeakPlus tactical flashlight as always), they usually take long fishing trips to the best locations and of course, we know they have to always take the best catfish reels with them. Throughout the week, and in the months and years following, the Classic provides a showcase for getting entire families involved; those playing and those who want to start, hockey moms and dads and those-to-be, and everyone else who never really thought much about the skating or hockey, but might now be tempted to try. Could there be any better stage, any more national stage, for showcasing all of the best things about hockey and winter sports more broadly than that stretch of land that lies between the Washington Monument and the Lincoln Memorial? The sight of thousands of locals and visitors alike gathering to frolic on the site where so many Americans have gathered before? If nothing else, it’s a photo-op the NHL, or any major sport, could never duplicate. Yes, if you were to use Spreiregen’s original model of installing refrigeration coils in the shallow pool, there would have to be some temporary modifications – again, nothing outside the scope of a competent civil engineer. 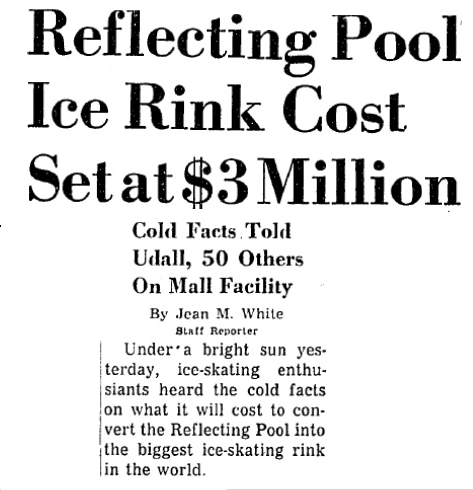 Or, using the NHL’s technique of building an ice rink up with consecutive layers of freezing water, a portion of the Pool could be drained and a base constructed on just one part for the building of a rink. If you can play outdoor hockey in Los Angeles at Dodger Stadium, you can build a rink in the Reflecting Pool. Yes, there are several small hockey rinks ringing Washington, and yes, they do a great job. But that’s not what this is about. Baseball may have come first, and football still draws in the most money, but hockey is every bit an American sport and pastime as any you can name. A seasonal hockey rink on the Mall? Think what could be done. Lessons to teach city kids and clumsy adults how to skate. A venue for players from PeeWee to beer leagues. Speed skating. Figure skating. Curling. Families of all sorts reveling in the cold in the most American of settings. “A carnival of humanity,” says Spreiregen. It would cost less than peanuts. It would provide hockey fans memories to last a lifetime. It would celebrate all that’s right about sport, and a nation built by visionaries. It’s an idea, we believe, whose time might finally have come at last. This entry was posted in Chicago Blackhawks, Washington Capitals, Winter Classic 2015 and tagged Paul Spreiregen, Reflecting Pool, Ted's Take, Winter Classic 2015. Bookmark the permalink.